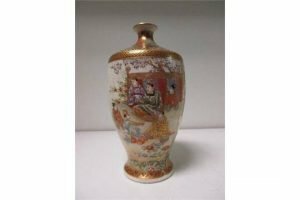 An early 20th century Satsuma vase, the shouldered ovoid body painted with a reserve of figures seated by a screen on one side and with a mother and children in a garden on the other, mark of Fuzan. 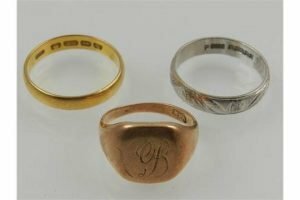 An 18 carat white gold band, together with a 22 carat yellow gold band, and a 9 carat rose gold signet ring having initials CB. 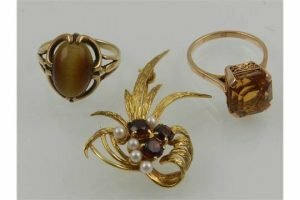 A 9 carat yellow gold, garnet, and pearl brooch, together with a 9 carat yellow gold and faceted citrine ring, and a yellow metal and tigers eye ring. 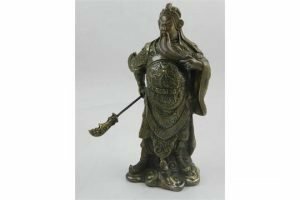 A Chinese bronze figure of Guang Gong holding a halberd, bears four character Qianlong style mark to base. 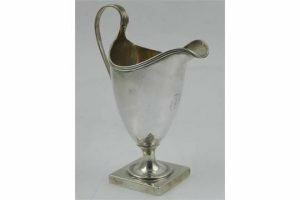 A silver helmet-shaped cream jug raised on square base, hallmarked London 1796, bears makers mark Peter & Ann Bateman. 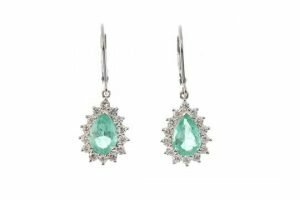 A pair of Colombian emerald and diamond ear pendants, each designed as a pear-shape Colombian emerald within a brilliant-cut diamond surround, to the hook fitting. Estimated total diamond weight 1ct. 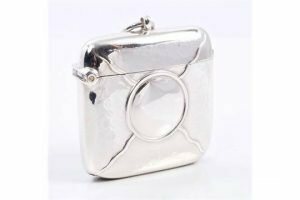 An Edwardian silver vesta case of square form, with Arts & Crafts-style decoration and spot-hammered finish, with vacant cartouche and suspension ring. 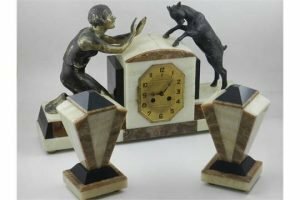 An Art Deco marble and figural mounted mantel clock with garnitures, the clock of stepped form and mounted with a young woman and a goat. 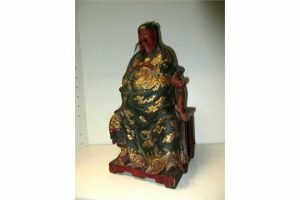 A 19th century carved wood temple figure of an Emperor, seated on a red lacquer throne wearing a dark turquoise green robe gilt with dragons amongst clouds, his beard and moustache of inlaid hair. 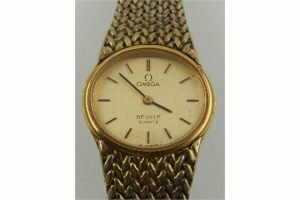 An Omega De Ville ladies gold plated wristwatch, quartz movement, the oval gilt dial with baton markers, fitted to a woven bracelet strap. 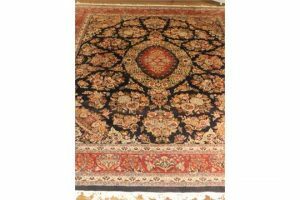 A Persian Tabriz style blue ground rug, woven with a central floral motif within a scattered floral field and wide conforming border. 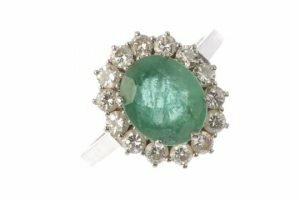 An emerald and diamond cluster ring, the oval-shape emerald within a brilliant-cut diamond surround, to the slightly tapered band. Estimated total diamond weight 0.75ct. 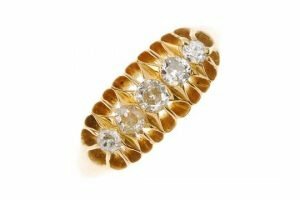 A mid 20th century diamond five-stone ring, the graduated old-cut diamond line with openwork scalloped gallery, to the plain band. Estimated total diamond weight 0.40ct. Hallmarks for Birmingham, 1942. 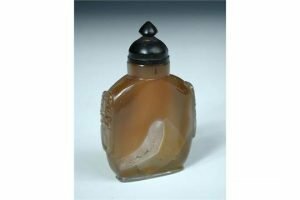 A 19th century agate snuff bottle with zitan wood stopper, the flattened and rounded rectangular sides flanked by mask and ring handles, the grey stone mottled brown. 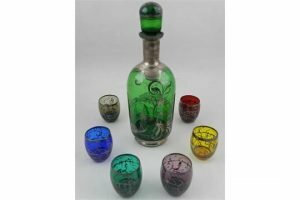 A green glass sherry decanter and six multi-coloured shot glasses, decorated in silver gilt with scenes of Venice amongst scrolling foliage. 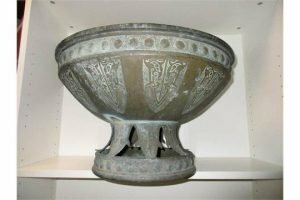 A 19th century bronze footed bowl, the rim raised above a band of ammonite scrolled bosses repeated on the foot rim, cut work daodieh cast lappets above and cast on the exterior sides of the bowl. 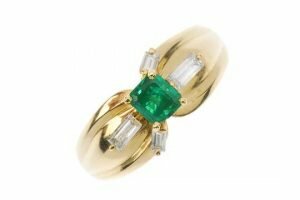 An emerald and diamond dress ring, the rectangular-shape emerald with graduated baguette-cut diamond asymmetric sides and grooved shoulders. Estimated total diamond weight 0.40ct. 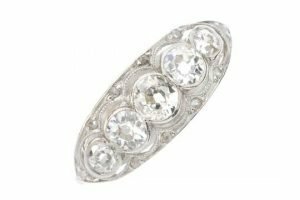 An early 20th century diamond dress ring, the graduated old-cut diamond collets within a lozenge-shape diamond point surround, to the plain band. Estimated total principal diamond weight 0.75ct. 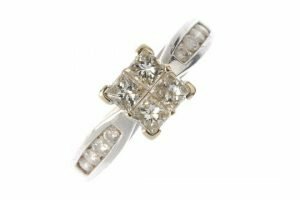 A diamond quatrefoil ring, the square-shape diamond quatrefoil to the graduated brilliant-cut diamond line sides inset to the tapered band. Total diamond weight 0.60ct.